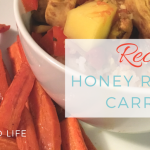 I was all set to make this week’s blog post about the mango curry chicken in the Real Read’s first book, Bread & Wine, but y’all… That is a lot of work. Miss Shauna wasn’t kidding when she said it looks like a lot of chopping. It is! And when you stink at cutting mangoes as much as I do and the Roma tomatoes are as out of season as they are, well… This wasn’t the dish for me. What did I take away from it though? The reminder that cooking can be a great meditative practice. While it feels good to cook for others, sometimes the soul needs quiet time (or time filled with your favorite podcasts) and a bowl full of goodies to chop, stir, or decorate. My go-to meditative kitchen practice involves a springtime risotto full of peas, asparagus, and warm chicken broth. Sure, I’ve discovered I can make pretty much the same thing in an Instant Pot or even the oven, but there is something to be said for twenty minutes staring into a pan of silky white rice that smells like heaven (AKA onions sauteed in butter). Alas, with two little ladies that love to help me cook, it’s not often that I get a full cooking session to myself these days. Most of the time, that’s okay. It is fun to see how much they like to “help” get dinner ready. Instead, I involve them in my practice and make these honey roasted carrots. They run in at the start, so they can help me wash the carrots. Usually, they get bored when I turn the water off, so I still get five minutes of peace to peel and chop the carrots on my own. I call them back to let them coat the carrots in the oil, honey, and spices and we put them in the oven together. 40 minutes later, we put these carrots on the plate and they show off to Randy. “Look at what we made, daddy!” 9 times out of 10, helping in the kitchen = eating what they made, so a little extra mess is totally worth it! 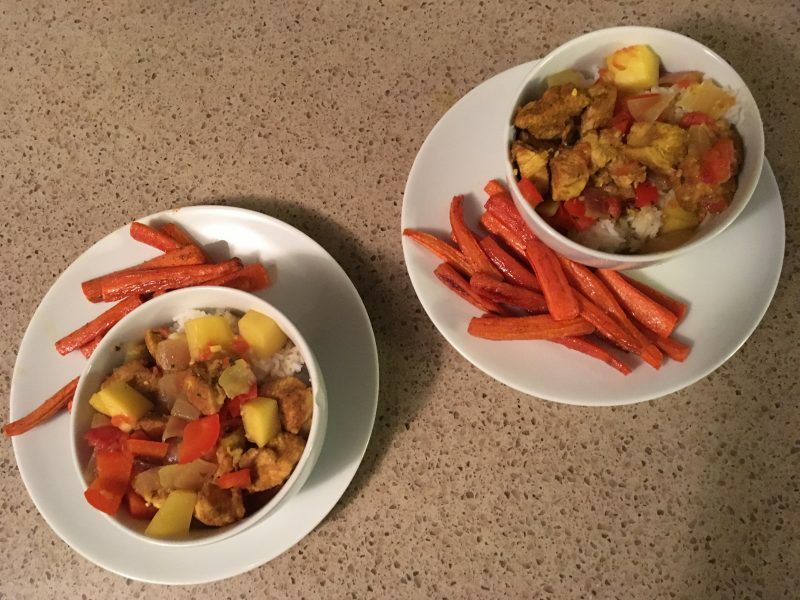 This last time I made the carrots, was when I tried Shauna’s curry. The curry took forever to come together, so the carrots had to spend an extra 25 minutes in an oven with the heat turned off. They still came out perfectly soft without being mushy. The flavor is perfect by itself and accompanies any main course nicely. We’ve even taken to putting leftovers in the ladies’ lunches since they are soft enough for toddler’s teeth. 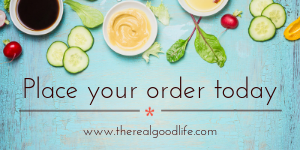 Try it out, let me know what you think, and share in the comments – what dishes take you to a zen-like place? 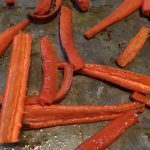 The flavor of these honey roasted carrots is perfect by itself and accompanies any main course nicely. Make it before you start your main course and let it hang out in the oven. They'll be fine for a little extra time. Preheat the oven to 350 degrees. Grease a baking sheet with cooking spray. Peel the carrots and chop into 3" slices of equal diameter. Place on prepared baking sheet. Drizzle on olive oil, honey, salt and pepper. Using your hands, stir to evenly coat and spread into an even layer. Bake for at least 40 minutes. Might take longer to get to desired level of doneness. If you need to more than an hour, simply turn the oven off, but leave them inside. Thank you to AllRecipes.com for the inspiration this recipe.